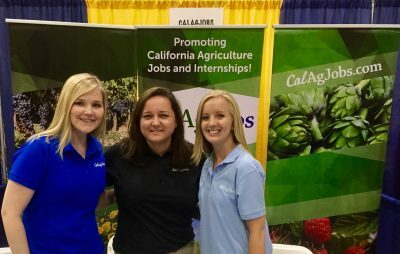 CalAgJobs had the pleasure of attending the 89th Annual California State FFA Convention in Fresno on April 23rd and 24th, with the goal of encouraging the 7,000 students attending to pursue careers in agriculture. While at the conference, we hosted the FFA Alumni Reception, attended the third General Session, and had a booth at the Trade Show. The CalAgJobs team at the 89th Annual California State FFA Convention trade show. The FFA Alumni Reception was a great opportunity for FFA Alumni 21 years and older to mingle, connect, and network with each other. We heard from members of the California FFA Foundation about how to join the Alumni Foundation and about the amazing things current FFA members are involved in. Following the reception, attendees were invited to sit in on the third General Session of the convention. During this session, we watched a video highlighting the 24 years that the California State FFA Convention has been held in Fresno, following the announcement that the convention will now be held in Anaheim. We also witnessed very deserving FFA supporters be honored with Distinguished Service Citations and Honorary State FFA Degrees! 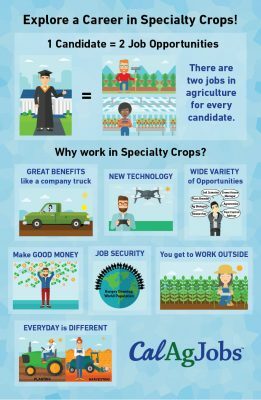 Explore a Career in Specialty Crops, a free classroom poster for agriculture teachers. At the Trade Show, we interacted with students, parents, and agriculture teachers at our booth, where we handed out flyers posters. Our conversations focused on getting students to consider careers in agriculture, particularly in specialty crops. We informed them that there are two jobs for every candidate in agriculture, and four jobs for every candidate in the crop and plant science sectors. Our new poster (shown on right) is geared toward the student audience to help them see the variety and abundance of opportunity in agriculture. We handed out almost 1,000 of these posters to students and teachers to display on their classroom walls. Many agriculture teachers were eager to learn about the resources we provide that encourage students to pursue agriculture education and careers. Students asked us great questions about obtaining internships, choices for college majors, career opportunities in crop sciences, and about our company. It was great to see students so interested and dedicated to their futures in agriculture!